Born in Dublin, Ireland, Barry started out as a trainee with Coventry City, signing professional forms in August 1996. Despite some eight years at Coventry, he barely made 100 appearances, although he also played 5 games for the Republic of Ireland side. 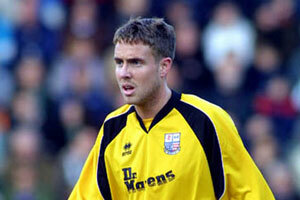 He arrived at Nene Park on 9 January 2004 for a one month loan, making four starts for Diamonds. He returned to Coventry, and went out on loan to Oxford United for the remainder of the season. He was released at the end of the season and joined Oxford United.on a permanent basis where he made some 200 appearances before his release in May 2009. On 30 July 2010, he signed for Southern League Premier side Brackley Town. After some eighteen months with the Saints, he went on loan to UCL Premier side Daventry United on 12 January 2012, making the move permanent before the end of the month. Unfortunately, the club folded at the end of the season and he is thought to have retired.